Tulsa Agenda - March 2019 "Unity in the Community"
Note that the scheduled OKC event was postponed due to an ice storm. 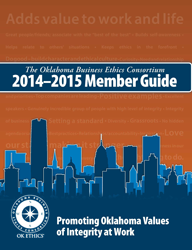 August 2015 - OKC- Arthur Gibb, Ph.D.
August 2015 - Tulsa- A. Gibb, Ph.D.
Click the image above to view FY 14 -15 Member Guide. 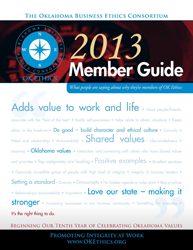 November 2014 OKC - Ron Paul Hill, Ph.D.
November 2014 Tulsa - Ron Paul Hill, Ph.D.
Click the image above to view FY 13 -14 Member Guide. September 2013 - Tulsa - Integrity Wins: Facing "The Herd" - Mick Ukleja, Ph.D.
March 2013 - OKC "Integrity + Purpose = Happiness" - Marilyn Tam Ph.D., Speaker, Author, Consultant, Board Certified Executive/Corporate/Leadership Coach, and Founder and Executive Director of Us Foundation. March 2013 - Tulsa "ReLaunch" - Dr. Mark Rutland, President, Oral Roberts University. February 2013 - OKC “Overcoming Cultural Barriers to Integrity” - Lori Tansey Martens, President and CEO, International Business Ethics Institute. November 2012 - OKC "Fish! and the Power of Ethics" - Harry Paul, co-author, Fish! October 2012 - OKC "Building Ethical Muscle" - Thomas Hill, Chairman, Kimray Inc.
September 2012 Tulsa "Ethical Intelligence" - Bruce Weinstein, Ph.D., "The Ethics Guy"
May 2012 - OKC "An Ethical Approach to Substance Abuse" - Jim Priest, Executive Director of F.A.T.E. April, 2012 - Compass Awards, Featuring Stephen M. R. Covey, author of Speed of Trust and Smart Trust; award recipients MESA, OGE Energy and Larry Nichols of Devon Energy. November 2011 - Tulsa - "When Worlds Collide: Internal Conflict & External Communication"
Gayla Sherry - Gayla R. Sherry Associates, Inc.
"Conflict, Ethics and R-E-S-P-E-C-T: How to disagree without being disagreeable"
August 2010 - Tulsa - "Civility Lost?" July 2010 - Tulsa - "LIAR LIAR"
June 2010 - Tulsa - "The Pursuit of Something Better"
"Lifting Others Up When The Chips Are Down"
March 2010 - Tulsa -"The Speed of Trust"
February 2010 - OKC - David Prater - "The Ethics of Prosecution"
February 2010 - Tulsa - "Men of Integrity - The Tulsa Way"
January 2010 - OKC - "Native American Wisdom"
December 2009 - Tulsa - "An Ethical Approach to Office Politics"
December 2009 - OKC - "An Ethical Approach to Office Politics"
August, 2009 - Moore Norman - Dr Tom Boyd, "Ethical Maturity"
July, 2009 - Moore Norman - Vernon McKown, Ideal Homes on "Walking the Talk"
May, 2009 - OKC - NASBA program featuring Larry Bridgesmith, Lipscomb University on "Ethics and Interpersonal Conflicts"
March, 2009 - OKC - Clifton Taulbert, "The Ethical Leader: Impact & Influences"
February, 2009 - OKC - "Swimming Naked: Bold Truths for Bad Times"
February, 2009 - Tulsa - "Core Values & Corporate Responsibility - 100 Years of History"
January, 2009 - OKC - "Generational Differences in Ethical Decision-Making"
January 2008 - OKC Meeting Agenda; Jim Priest on "The Ethics of Exits"
September, 2008 - OKC Meeting, "Truth Under Fire"
Agenda Banners: contact Shannon Warren for banners to be used headers for meeting agendas.